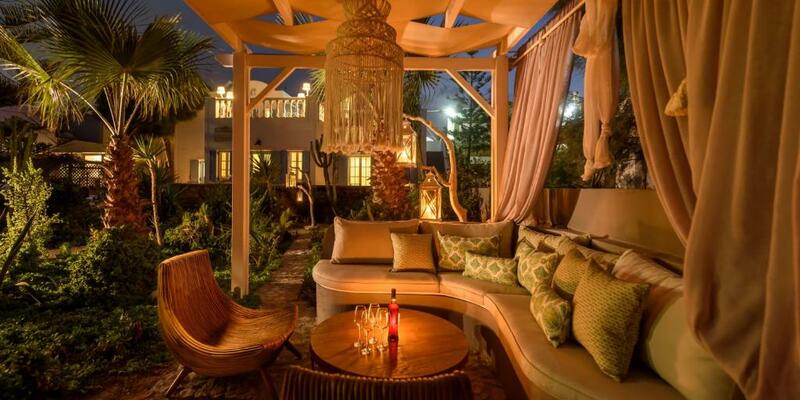 Wonderful location, basically on the beach with private chairs and umbrellas. Literally few steps from the promenade with countless shops and restaurants, but still secluded enough for relaxation. Extremely friendly and helpful hosts (thank you again, Vangelis and family for a really outstanding vacation). Breakfast served on the private porch, functional bathroom and comfortable rooms. Beach is just a step away! The garden in the entrance welcomes you as you arrive, and gives you a nice view from your room. The staff are very nice and welcoming! When my husband and I came to Santorini for his sister's wedding, we stayed at Ocean Bay Suites. It was a wonderful stay. It is located just in front of the ocean, so we could see the sea from our room, even from lying on the bed. Breakfast on the balcony every morning with a sea view is a really nice way to start the day. People say frequent airplanes passing over your head is a negative point, but it didn't bother me so much. Airplanes passing over your heads while you are swimming is a unique experience. Vaggelis, Anastasia and staff of the hotel were very friendly and so nice. We were very satisfied with our stay in Santorini. We highly recommend this hotel to you! Amazing place to stay would highly recommend. everything from start to finish was superb vagelis and his wife are lovely as is there beautiful suites breakfast is amazing a changed every morning you will not be disappointed. Vaggelis was a wonderful host, and the property is amazing. The view from our room was beautiful, and the breakfast was amazing. From the moment we arrived, Vangelis, was very attentive. He is very informative about activities and sights to visit. He helped us arrange a catamaran day trip which was amazing. Breakfast served right on your balcony. The hotel is located right in front of the beach without any obstructions. The garden on the property is beautiful. The rooms are exquisitely decorated, clean and roomy. A/C and wifi works well. Plenty of dining options are within walking distance. Bus stop is near by for transport to Fira and Oia. Superlatives all around! The host was so friendly and helpful! He was so kind and attentive to every detail of our visit. We wanted to stay longer. 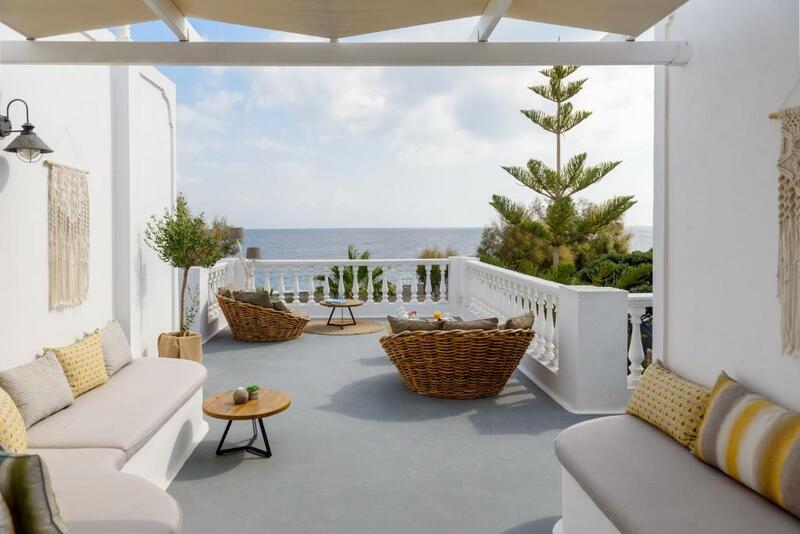 The quiet location, private garden and unobstructed view of the sea made it the perfect choice for us. We will recommend it to friends who travel to Santorini and want to stay in a quieter town than Oia or Thira. the owner of the property was a wonderful man and did his very best to ensure that we were looked after. He gave us recommendations on what to do, where to go, bus system, walks, flight boarding passes. The host was good in accommodating dietary needs for breakfast. The property was a good location to the beach. Lock in a great price for Ocean Bay Suites – rated 9.6 by recent guests! 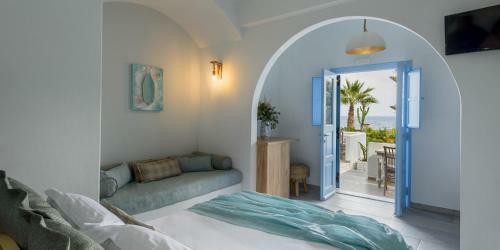 These Cycladic-style rooms are located on the famous black Kamari Beach, equipped with free sun beds and umbrellas. Ocean Bay Suites offer a hot tub and accommodations with views of the sea, sunrise and garden. 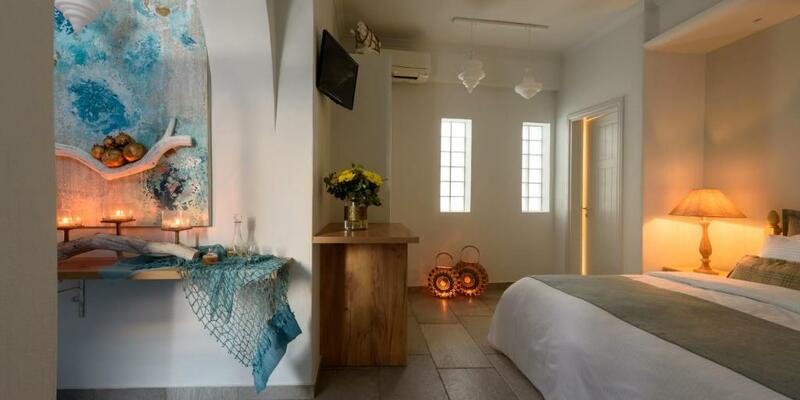 The bright and sunny rooms have a mini fridge, air conditioning, as well as a TV and free Wi-Fi. Lively Kamari offers a variety of restaurants, cafes and shops, a few minutes’ walk away. Car rental can be arranged on site. Free public parking is available nearby. Complimentary sun beds and umbrellas are provided on the beach for the guests of Ocean Bay Suites. 뀐 Located in the real heart of Kamari, this property has an excellent location score of 9.5! When would you like to stay at Ocean Bay Suites? Located on the ground floor, this room offers views of the garden and the Aegean Sea from its balcony or veranda. It features air conditioning, free WiFi, TV and hairdryer. Breakfast is served in the room or the balcony, while free sun beds and umbrellas are offered to guests. 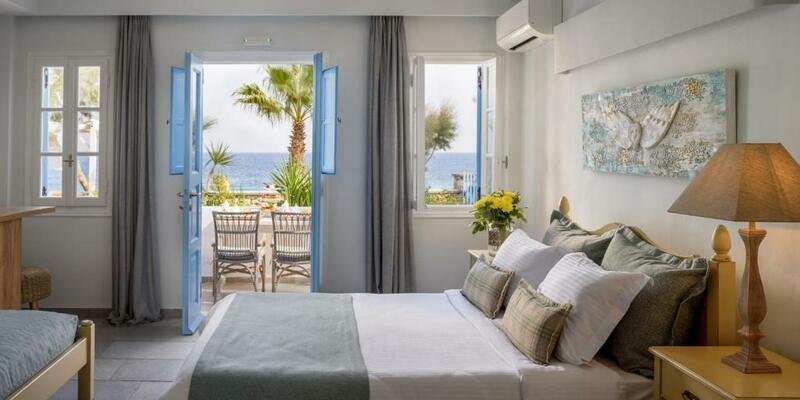 Located on the ground floor, triple rooms have a balcony or veranda with direct views of Aegean sea. They come with air conditioning, free WiFi, TV and hairdryer. Breakfast is served in the room or the balcony, while free sun beds and umbrellas are offered to guests. Upper-floor room with panoramic views of the gardens and the Aegean Sea. Each room comes with air conditioning, free WiFi, TV and hairdryer. Breakfast is served in the room or the balcony, while free sunbeds and umbrellas are offered to guests. Our guests usually wear their swim wears all day and go from the room to the beach and back. They rest at the sunbeds and umbrellas we offer on the beach... reading a book and enjoying the sun and the sea. We are located at the begining of the beach promenade which is the central market street of Kamari and where you can find all restaurants, shops, cafes, bars. the bus stop is 300meters away from our hotel to get to any place at santorini. House Rules Ocean Bay Suites takes special requests – add in the next step! Ocean Bay Suites accepts these cards and reserves the right to temporarily hold an amount prior to arrival. Please inform Ocean Bay Suites of your expected arrival time in advance. You can use the Special Requests box when booking, or contact the property directly using the contact details in your confirmation. As the property is close to the airport (which we found as a bonus) there can be some noise from the planes landing, but we weren't bothered by that at all and will gladly return next year. It isn’t the hosts fault but sadly the hotel is very close to the airport and as a result it is quite noisy. this is a wonderful trip for me, imagine when you open the door you could see directly the blue sea, and also the landlord vagelis is so warm heart, he could tell you everything and meet every your requirement, this is a great place, when next time i come to santorini, i will be here also. Everything about the hotel is great, apart from the location right under the landing path of Santorini airport. The noise and sight of the approaching flights can be quite intimating. Planes do not land between 11 and 5 so you can have a good night's rest, but if you leave the windows open you will sure wake up at around 5. If you are not too fussy with ambient noise, however, you may find the planes less intrusive than the constant music in the nearby resorts. The hosts are warm, welcoming and very friendly. The property has wonderful garden and an unbeatable view to the sea. There is a wonderful attention for detail in design. The breakfast too is great and served right to your terrace. This is a great place to hang out after the rush of the major sights in Santorini. The welcome, daily breakfast, gardens, beside the beach and lots of restaurants nearby. Area very clean. Vaggelis was very helpful and arranged all our trips and quad bike hire and let us enjoy our holiday. Perfect location. Absolute only thing I can think of is to have a bit of cutlery in the room just like a teaspoon for hot drinks during the day. The view, the host, the location and of course the breakfast - it was all amazing! The breakfast and view was amazing. The hosts were very welcoming and great at providing information. First of all a huge thank you to our host Veggelis! The breakfast every morning on the balcony was excellent. The room was beautiful with a brilliant view of the beach. I can't emphasise enough that Ocean Bay Suites is in the most perfect location, the beach is stunning and from any room you will have an uninterrupted view. A wonderful experience with generous and welcoming hosts. Everything was great - breakfast delicious, beds comfortable, cleaning lady wonderful and helpful and location perfect. Thank you so much!